Most of us have experienced the scratchy, aching pain of a sore throat at least once in our lives. The discomfort is often caused by a virus, the effects of a known health condition or certain medications. When only one side of your throat hurts, it could signal a specific condition affecting your tonsils, lymph nodes, or lymphatic tissue. Or it could just be the unpleasant result of recent dental work as you sometimes breathe differently depending on the procedure done. 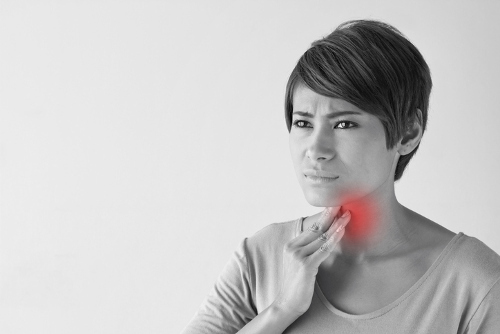 Let’s take a closer look at why you may have a sore throat on one side, regardless of whether the right or left side of the throat hurts. What Causes a Sore Throat on One Side? Whether it is the left or right side of your throat, discomfort and pain can be presented by various health conditions ranging from mild to severe. Some can be taken care of with home remedies, while more serious symptoms should be treated by your doctor. 1. Dental procedures or conditions can result in a sore throat on only one side. An abscessed tooth or gum disease can cause your throat to ache, particularly if there is an infection that can spread into the throat region. The position you rest in during a procedure can also affect your breathing ability, resulting in a sore throat. 2. Common cold or flu symptoms most often include a sore throat. You may feel this more on one side during resting hours if you sleep on one side as the mucus will drain into your throat from your nose. 3. Swollen lymph nodes from an illness such as a cold or ear infection can be felt on either side at times. When the neck lymph nodes became enlarged, they are usually felt more on one side. 4. Vocal cord nodules are calluses that appear on the vocal cords after continuous use of voice with little rest. They can make a particular spot in the throat very sore. 5. Strep throat, or a bacterial infection, can target one side of the throat region and sometimes will begin on one side and radiate over to the other side. 6. Tonsillitis occurs when your tonsils become inflamed from an infection, whether it be from a virus or bacteria. 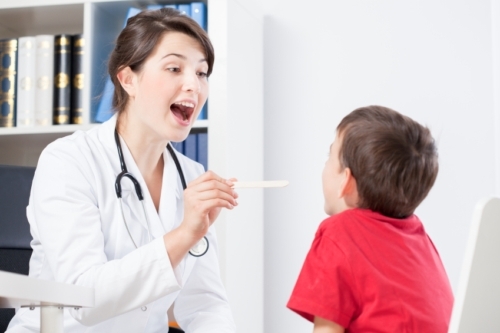 A severe sore throat on the left side, right side, or throughout the entire throat, is the first sign of tonsillitis. 7. Peritonsillar abscess can cause the throat to be very painful on one side. A complication of tonsillitis, this develops from a pus-filled sore near the tonsils. While some of the causes of a sore throat on one side will require you to seek medical attention, there are home remedies to relieve the pain and discomfort. Some experts recommends any of the following therapies. Taking deep breaths in an enclosed room of steam will soothe an aching throat as well as loosen any mucus you may have. This is very effective whether you are in the water or just in a small bathroom with the door closed. Using a humidifier to put moisture in a dry room will help a sore throat, if not prevent one from starting. You can also use essential oils such as eucalyptus to clear any respiratory issues that cause a sore throat. Combine a few drops of honey in a cup of tea or take a spoonful of honey to help ease an aching throat. Cold water can help take the sting out of a sore throat and will keep you hydrated to prevent worse pain from being dry in the mouth and throat. Use the ones that contain honey or eucalyptus for added sore throat relief. Avoid ones with added menthol as this can cause more discomfort before any good effects are felt. This age-old remedy is quickly and easily accessible, and fast-acting. Mix one teaspoon of table salt with a cup of warm water and gargle in your throat. Try not to swallow it as it may cause more pain. Repeat several times daily while experiencing a sore throat or cold. So, have you tried all the remedies and still suffer from a sore throat? Or perhaps you have accompanying symptoms such as high fever, rash, fatigue, stomach pain, or other conditions that interrupt daily activities? It may be time to visit your doctor or seek medical help. Difficulty swallowing can also lead to dehydration, eating difficulties, and possibly hinder your breathing and should be checked out by a doctor without delay. A sore throat can suddenly begin at any time, regardless of your current health condition. A pain on the left or right side of the throat can be an indicator of an underlying health issue, or it may just be a sore throat. The throat can come into contact with foreign particles, viruses, and bacteria that settle into the tissue. The area can become inflamed and cause pain on one side of the throat. Depending on the severity and cause, you may be able to manage your pain at home.If you experience an achy or painful sore throat with no relief after a week, talk to your doctor. If your sore throat is accompanied by other symptoms, seek medical advice immediately. How Long Does Strep Throat Last in the Elderly and Adults?